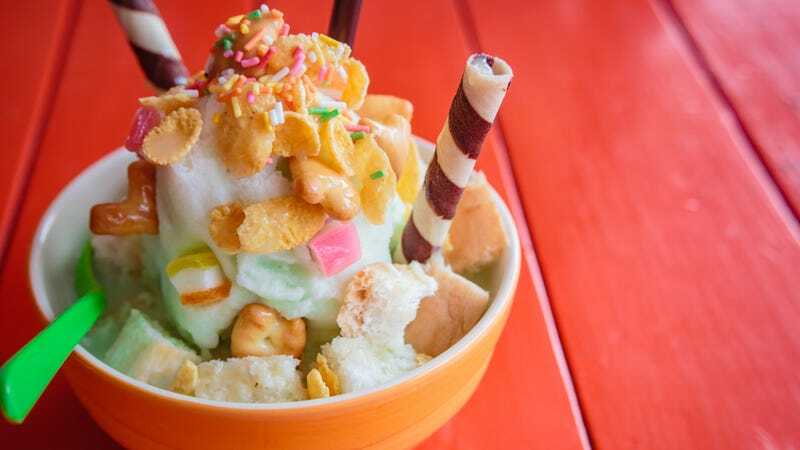 Nashville is abuzz with news that an upcoming ice cream shop will feature cereal-infused ice cream. The Cosmic Creamery will open next month alongside cookie dough shop, NoBaked Cookie Dough, both owned by Megan and Jimmy Feeman. As a delightful hypnotic video shows, customers will be able to choose their favorite cereal, along with fruit and yes, even candy to be infused into what looks like vanilla soft serve in a cone. The Tennessean reports that customer will also be able to choose from among the space-themed shop’s signature flavors, like “The Rocket Man infused with Fruity Pebbles, Star Dust infused with Lucky Charms marshmallows and The Milky Way infused with Cookie Crisp and mixed with chocolate chip cookie dough from NoBaked.” This takes cereal milk to an entirely new, solid level. Any other ice cream + cereal combos sound good? Let us know, we beg you.